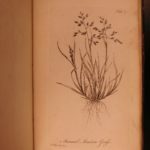 Benjamin Stillingfleet was an English botanist most known for his ‘Calendar of Flora’ which was based on the studies and observations of Theophrastus. This work, consisting of various botanical and scientific treatises, formalized the study of plant and animal life and phenomena. ‘Tracts Relating to Natural History’ features an impressive collection of eleven full-page engravings depicting plants and six distinct essays on the principles of Linnaeus. London : Printed: and sold by R. and J. Dodsley; S. Baker; and T. Payne, 1762.